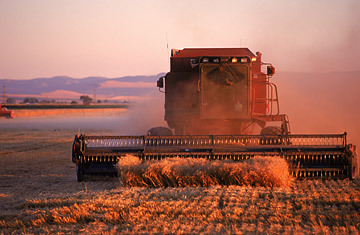 Farmer finishes cutting a field of wheat. Let's hear it for rank partisanship and mindless obstructionism. Senate Republicans did the right thing for the wrong reasons on Friday, blocking a popular but execrable $286 billion farm bill over an esoteric procedural dispute. In doing so, they gave up the opportunity to shower more money on farm country in a calculated partisan effort to embarrass the Democratic majority. Now both parties will spend the next few months  and maybe the entire next year  blaming one another for delaying legislation that deserves to be destroyed. I explained recently in the pages of TIME why the farm bill was bad agricultural, fiscal and environmental policy; bad water, energy, land and health policy; and bad foreign policy to boot. At a time when farm incomes are at an all-time high, the legislation would perpetuate a system that redistributes billions of dollars from taxpayers to wealthy farmers, particularly the huge industrial operators who devour the most water and fossil fuels, spew the most pesticides, erode the most soil, grow the most fattening foods, and use their handouts to buy out smaller farmers and depopulate rural America. Only 1% of Americans are farmers, and the largest 5% of those farmers vacuum up three-fourths of the subsidies. The subsidies also flout our international trade agreements, and end up severely damaging the non-agricultural sectors that make up the other 99% of our economy. But that's not why the Republicans blocked the bill, which cruised through the Senate Agriculture Committee without a dissenting vote. They blocked it because Senate Majority Leader Harry Reid refused to let them bog down the floor debate with scores of unrelated amendments designed to box Democrats into uncomfortable votes on issues like immigration and the alternative minimum tax. Most Senate Republicans like the farm bill just fine  Richard Lugar of Indiana is an honorable exception  but not as much as they like attacking the do-nothing Democratic Congress. They needed 40 votes to block Reid's effort to shut off debate, and they got 42, so Reid yanked the bill. So now what? The coalition of environmentalists, aid groups, health advocates, rural groups, anti-tax activists, sustainable agriculture groups and free traders who fought unsuccessfully for reform will get another chance when the Senate takes up the bill up again  possibly as soon as December, or conceivably as late as 2009. But politicians are amazingly reluctant to oppose farm bills, because they don't want to be portrayed as enemies of the heartland of America, and they don't want to cross the powerful farm lobby. Some politicians are already talking about extending the 2002 farm bill for another year, but there's going to be heavy bipartisan pressure to pass a new bill with new goodies. Politicians from disaster-prone states like the Dakotas and Montana won't want to give up the $5 billion "permanent disaster fund" they tucked into the Senate bill to protect marginal farms. And the corresponding House bill includes scads of new money for nutrition, conservation, fruit and vegetable farms, organic certification, and other programs desired by various interest groups. That's why even the National Wildlife Federation sent out a press release Thursday declaring: "Senate Needs to Move Farm Bill Forward." Incidentally, this is the second time in a week that environmentalists are clamoring for a bloated bipartisan bill with terrible ecological consequences because some of the bloat was for them; last week, they cheered when Congress overrode President Bush's veto of a pork-stuffed smorgasbord of Army Corps of Engineers water projects because it included a few projects for the Everglades. Next time you hear a green group complain that America's farm policies and water resources policies are degrading America's natural treasures  the Gulf of Mexico, the Chesapeake Bay, the Colorado River, the Everglades  ask whether that group was on the side of reform, or whether it sold out their larger cause for a few projects it could brag about to donors. But for now, the farm bill is on hold, because Senate Republicans are more deeply committed to irresponsible partisan politics than irresponsible bipartisan policies. In Washington, this passes for good government.